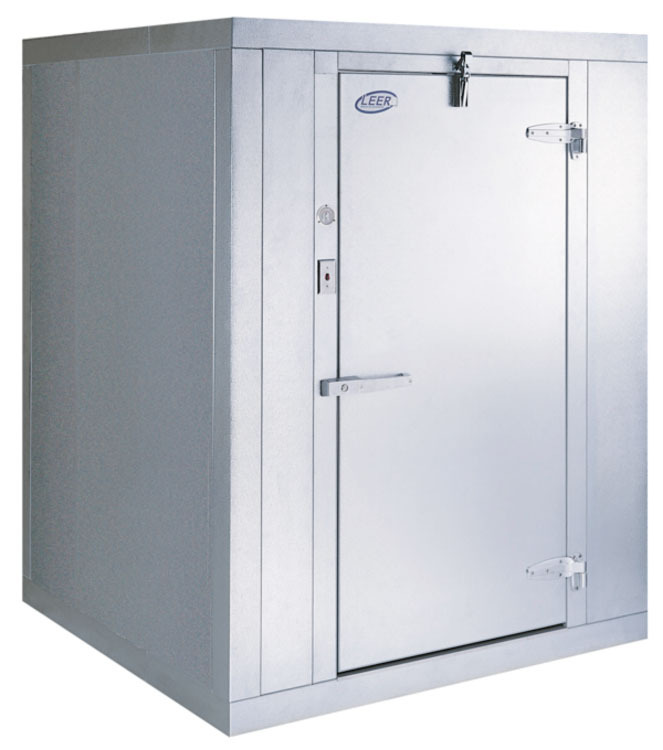 Cooler Boxes are designed to connect to the refrigeration already emplaced in a commercial kitchen space. Units are extremely easy to assemble, and myBoetler different configurations to fit perfectly into the desired space. A cooling storage space is perfect for storing bulky items, ingredients and supplies. Leer Quick Ship Walk-in Cooler, 9' 8" x 9' 8" x 7' 6"
Leer Quick Ship Walk-in Cooler, 9' 8" x 7' 9" x 7' 6"
Leer Quick Ship Walk-in Cooler, 9' 8" x 5' 10" x 7' 6"
Leer Quick Ship Walk-in Cooler, 9' 8" x 17' 4" x 7' 6"
Leer Quick Ship Walk-in Cooler, 9' 8" x 11' 7" x 7' 6"
Leer Quick Ship Walk-in Cooler, 7' 9" x 9' 8" x 7' 6"
Leer Quick Ship Walk-in Cooler, 7' 9" x 7' 9" x 7' 6"
Leer Quick Ship Walk-in Cooler, 7' 9" x 5' 10" x 7' 6"
Leer Quick Ship Walk-in Cooler, 7' 9" x 17' 4" x 7' 6"
Leer Quick Ship Walk-in Cooler, 7' 9" x 15' 5" x 7' 6"
Leer Quick Ship Walk-in Cooler, 7' 9" x 13' 6" x 7' 6"
Leer Quick Ship Walk-in Cooler, 7' 9" x 11' 7" x 7' 6"
Leer Quick Ship Walk-in Cooler, 5' 10" x 9' 8" x 7' 6"
Leer Quick Ship Walk-in Cooler, 5' 10" x 7' 9" x 7' 6"
Leer Quick Ship Walk-in Cooler, 5' 10" x 5' 10" x 7' 6"
Leer Quick Ship Walk-in Cooler, 5' 10" x 17' 4" x 7' 6"
Leer Quick Ship Walk-in Cooler, 5' 10" x 15' 5" x 7' 6"
Leer Quick Ship Walk-in Cooler, 5' 10" x 13' 6" x 7' 6"
Leer Quick Ship Walk-in Cooler, 5' 10" x 11' 7" x 7' 6"